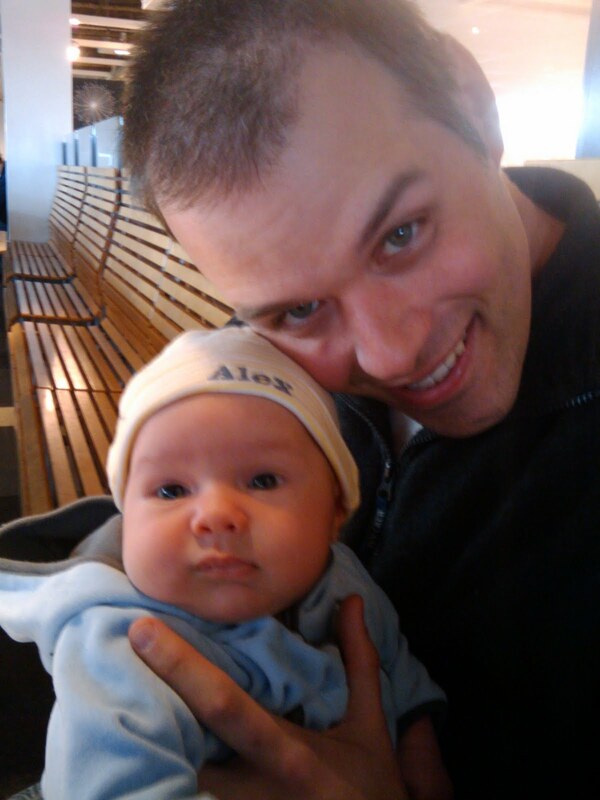 “A hoo … whoo … blllb … ulm … bubboo ..“, Alex age 8 weeks. This week, Alex started to make real noises. He’s started to coo at lights and people. It’s a bit undirected at this point, but there are definitely times when it seems like he’s trying to communicate with us. In fact, as I’m sitting here in his room typing this blog entry, he’s trying to talk to the light-up, musical mobile we just put over his crib. Other things that happened this week include a reunion at the birth center, where he got to meet other babies born in January and February. We also were able to weigh him and with his clothes on, he weighed slightly over 15 pounds. In fact, he was almost the biggest baby there, even though he was one of the last ones in that group born. Firsts This was Alex’s first Easter, so that meant his first Easter service and first dinner with the Romanian crew out in Sterling, Virginia. The other biggie for the week was his first real road trip. We all went to Richmond to help celebrate Henry’s first birthday. Other, less notable events this week were his first trip to the mall (Pentagon City) and first bus ride. Ups The cooing is definitely cute and he’s definitely growing. Each day he seems to change just a little bit. He also seemed to be feeling a bit better. We’ve been able to get out a bit more. Downs Over the last 24 hours, he’s started to spit up a bit. In fact, on the car ride back from Richmond, he did really give us a good one. It required a stop and an outfit change. Hristos a inviat! Christ has risen! This week marked a somewhat more laid-back week than some of the previous ones, at least for the first half. The weather was a bit colder and rainy, so we ended up staying around the house and just getting ready for the rest of the family to come up for the weekend. The fun really started on Saturday when grandma and grandpa Oland arrived early afternoon and aunt Julie and her crew arrived a bit later. They all came to see Alex and specifically to attend his dedication at church on Sunday. The dedication on Sunday went well too. Turns out that not only was Alex dedicated, it was the first week for our church to meet in the new building. That made the morning doubly special. Firsts Maybe not exactly a first for him, it was the first time that both grandparents were here together to see him at the same time. And for those who don't know, that's quite an accomplishment as Feli's parents are from Romania and have only been here one other time since we've been married. Ups By the end of the week, Alex appears to have finally gotten past his growth spurt and whiney phase. He does still cry, but it happens much less frequently and he is a bit easier to console. Downs Aside from being a bit more unhappy than some babies, I can't think of any real downs for this week. I guess I need to come up with something a bit more exciting than … “ Another week’s gone by and Alex is another week older”, but it’s 9pm on a Sunday night … my creativity is gone. Feli and I are really enjoying watching as Alex continues to grow and develop. He’s definitely grown this week. I swear that each day that goes by he looks a bit different. The smiles are coming a bit more often and he seems to be sleeping a bit better, though he still has a long way to go. Bunu and Buna are still really enjoying getting to spend time with him. It’s cute to watch Buna as she’ll sometimes look at him and start to tear up. She says she’s going to miss him so much when they leave. Fortunately it’s another six weeks before that happens. Firsts Big firsts for this week were a trips to: IKEA, the National Arboretum and Home Depot (twice … it’s been one of those weeks). His other big first was a trip to church where he generally slept through the service, until he decided he was hungry. 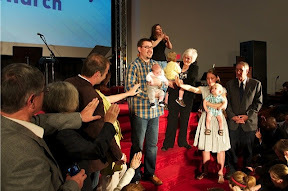 He then downed a bottle and let for the biggest burp I’ve heard from him ever … right at the end of the pastor’s sermon. Fortunately it was a tape instead of a live service. Ups Our little guy is growing almost constantly, or so it seems at least. There have been a couple of days this week were Feli and I both looked at each other and said that he’d changed in just the last 24 hours. Downs Just when we thought he was getting to the end of his whiney period, it came back. Of course, that appears to have been because he’s hit his second growth spurt, but still. Michael took off today so we headed to IKEA. My parents worked so hard the entire week, we had to get them out of the house and show them something else. This is Alex's first trip to IKEA too and so far he's loving it, especially when daddy holds him like this. Yesterday was not such a good day for us, we went from having two great strollers, to having none! The urban, chic stroller I got from my colleagues suffered a little 'trauma' when it decided to go down the front stairs by itself and flipped over. The basinet broke on each side and is not stable anymore. The other stroller worked with our car seat and it was a lighter, easy to throw in the car and take it along. I lucked out when I got it for free from another mom on MOTH (Mothers On The Hill yahoo group). Well, this stroller got either stolen or taken away by the trash collectors on Monday morning. Michael unloaded something from the trunk of the car so he put the stroller outside the garage planning to put it back inside when he was done. We assumed he forgot to do that because a day later when we wanted to use it (after the other one broke), we realized it had vanished! The sad part is that these strollers combined cost over $ 500, the good part is that we got them both for free. We ordered a new stroller off Amazon this evening (thanks to all the gift certificates we got there!!) so by Thursday we should have a new one. Alex enjoys being outside so much, we can't wait too long until another great deal comes along. So another week has come and gone and Alex (and I guess the rest of us) is a week older. This has been an intestine week for him. Probably the top item of the week is the arrival of Bunu si Buna (grandma and grandpa in Romanian). They've come in for a two month visit. Other than that, Alex had his one month doctors appointment. At the visit, he had gained another pound, up to 12 pounds and he's 22 inches long. The doctor says he is growing just fine and appears to be quite healthy. Firsts Of course, the big one is meeting his grandparents. He also seems to have grown into 3-6 month clothes. Also. We started using the "tummy tub" for bath time. Boy does he seem to like it. Ups He is smiling more and seems to be sleeping a bit better than before. Downs Alex is still a bit more cranky than before. He tends to cry more in the evenings than in the day time.